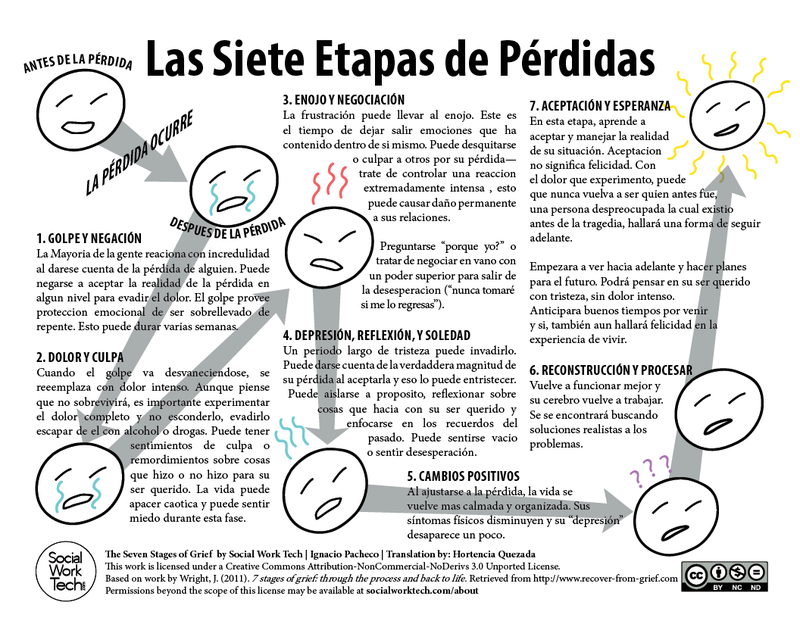 I made a handout for the Seven Stages of Grief that I give to clients when dealing with loss. In serving Spanish-Speaking populations, primarily Mexican, I saw that there was a need for this intervention to be translated. I got some help with it and did my very best to translate this document in the spirit of what it was intended to do: provide an explanation for loss in a simple and non-academic way. It should be noted that “grief” translates to “duelo”.“Pérdidas” translates into losses/bereavement, I’m more inclined to use that word… When talking with my clients, “pérdidas” is more appropriate when talking about losses of loved ones, break-ups, etc. If you like this Social Work Tech Tool, please spread the word. If you are a Spanish-Speaker and want to submit any corrections you see might be helpful, please leave a note in the comment. Thank you! I just got thrown into facilitating a 90min grief and loss (Hi social work!) and was given and all English curriculum. This is super helfpul!! Thanks for sharing this wonderful resource. I would love to use this visual aid for my Spanish speaking patient and families. I work in a hospital with patients who have life-limiting illnesses and experience many kinds of losses. I’m wondering whether you will be updating this tool to reflect that grief does not occur in stages or in a checklist and that it is rather much more diverse depending on the individual. I just found your website and I’m enjoying the information you provide.